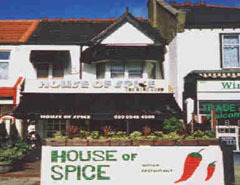 Visit the House of Spice for a unique dining experience. Sample the scents and flavours of the various spices laid out around this family run restaurant. Authentic décor – saffron walls and wood floor. Al fresco dining on our terrace. The menu offers fine Indian cuisine with fish and seafood specialities. Sunday buffet lunch only £6.95 - eat as much as you like. Open Monday-Saturday 6.00-midnight. Open Sunday 12.00-3.00pm and 6.00-midnight. 10% discount on take-away. Free home delivery on orders over £10 within 2 mile radius. Fine Indian cuisine with fish and seafood specialities.